According to a recent news article in the Pantagraph, a jury in Indiana has just awarded $4.6 million to a 73-year-old man who developed malignant mesothelioma after being exposed to asbestos. He was exposed to asbestos over 50 years ago while working for a portable elevator company owned and operated by defendant. If you have ever seen a tall building under construction, you may have noticed that the contractors will erect an elevator on the outside of the unfinished building so workers can travel up and down the structure. These elevators have also been featured in many action movies over the years. It is not the general contractor, but rather a portable elevator company that sets up these elevators for use during the construction project and then removes the portable elevator when the job is complete. These portable elevators have metal frames that workers must weld and properly fit with electrical wires as part of the set-up job. 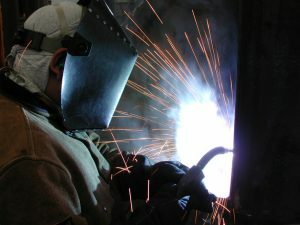 In this case, plaintiff was working for one of these portable elevator companies, and, as part of his job, he was required to use an arc welder. Arc welding uses an electric current supplied by a work cable that is clamped to the surface being welded. The welder will then holds a metal electrode rod in an electrode holder and applies it to the surface. When he or she does this, the electrode will complete the circuit, causing the current to arc, which will melt the metal electrode onto the work surface forming a bead of weld. In some applications, instead of solid metal electrode, the welder can use a flux-cored electrode that contains a mixture of metals and deoxidizers and other substances. In this case, the flux core contained asbestos, and the plaintiff was unknowingly being exposed to deadly asbestos fibers when he was welding. As our Boston mesothelioma attorneys can discuss during your initial consultation, in these types of cases, the question is not whether the material contained asbestos, since we know it did, and the question is also not whether the defendant’s asbestos caused your mesothelioma, since it likely did. The question is whether the defendant had knowledge the material contained asbestos and whether they had a reasonable duty to either use another material or warn the workers they were being exposed to deadly asbestos fibers. As a defense to these claims, the defendant will often argue that since they did not personally manufacture the substance that caused plaintiff to develop mesothelioma, they are not liable and had no duty to warn the plaintiff. However, we now know that those in the asbestos industry and many of the companies that purchased asbestos products were well aware of the toxic nature of the deadly asbestos fibers and also knew that the workers had no idea they were being poisoned. The reason for this is because it takes between 20 and 50 years for a plaintiff to become sick after first being exposed in many cases. In this case, the jury found that defendant was well aware that its workers were being exposed to asbestos, and that was reflected in its award.